This article is about the quest. For the book, see The Sublime Brazier (book). Put an end to Molag Bal's plot in the Imperial City. Molag Bal seeks to destroy the Sublime Brazier—the key to rekindling the Dragonfires. Working with The [sic] Drake of Blades, Captain Caudex, and Father Egnatius, I must find a way to protect the Dragonfire Cathedral, and the brazier within. Talk to the Drake of Blades in the Alliance Base. Find The Rat's message in the Sewers. Return to the Drake of Blades. Go to the Dragonfire Cathedral. Hold off the assaulting Daedra. Talk to the Drake of Blades. Return to the Alliance Base. Before we enter the Dragonfire Cathedral, I must retrieve a message from our unlikely ally, The Rat. According to the Drake of Blades, it may provide some vital information about Molag Bal's plans. I have The Rat's message. I must return to the Drake of Blades to finalize our plans for defending the Sublime Brazier. The Drake of Blades has decided to become the Sublime Brazier's immortal guardian. We must go to the Dragonfire Cathedral, buried deep beneath Imperial City, and perform a ritual to complete the Drake's transformation. We've reached a large cave beneath Imperial City containing the Dragonfire Cathedral. I must follow the Drake of Blades, Father Egnatius, and Captain Caudex inside to perform the ritual. 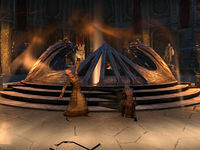 Father Egnatius has begun the ritual to imbue The [sic] Drake of Blades with Akatosh's power, but the Dragonfire Cathedral is under assault by the forces of Molag Bal. I must hold them off until Egnatius completes the ritual. Captain Caudex set up siege weapons to allow me to defend Dragonfire Cathedral's barricades against invading Daedra. I must hold them off long enough for Father Egnatius to complete the ritual. Daedra are assaulting the Dragonfire Cathedral from all sides. I must defend the barricades with the ballista while also fighting off Daedra who try to stop me. The Daedra have smashed the barricades and forced their way into the Dragonfire Cathedral. I must defend the Sublime Brazier at all costs. The Daedra are defeated and Father Egnatius has completed the ritual to imbue The [sic] Drake of Blades with Akatosh's power. I must witness the ritual's completion. The Drake of Blades has been transformed into the Sublime Brazier's immortal guardian. She wields the power of Akatosh, and will live forever, but cannot leave the Dragonfire Cathedral. I should see if she has any last words before we part. Finishes quest The Drake of Blades has become Akatosh's immortal guardian. She will remain in the Dragonfire Cathedral, defending the Sublime Brazier from any who would seek to destroy it for all time. I should speak with Father Egnatius back in the Alliance base.